In 1993, a manufacturing company in Virginia installed a set of FRP stairs made with EXTREN® structural shapes and DURAGRID® T0000-1" Pultruded Grating Stair Treads in a high foot traffic area of one of its plant locations. The company chose FRP due to its light weight and high strength properties, ease of installation and most importantly, FRP’s resistance to corrosion. After 20+ years of active service, the company removed one stair tread for lab testing of the tread’s residual flexural strength and modulus. 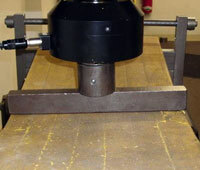 Test results showed that after numerous years in a manufacturing environment, the stair tread still exceeded current load table values. In the test, it took 695 lbs. to flex the tread ¼" and 6,429 lbs. before failure occurred. Anticipated load failure was ~5,200 lbs on a 30 inch test span (Note: Load Table Modulus is 4.0 x 106 psi; Test Modulus was 4.24 x 106 psi). Based on this test, it is reasonable to assume these stairs should last many years into the future. Click here for the complete case study.